C5a is a protein fragment released from cleavage of complement component C5 by protease C5-convertase into C5a and C5b fragments. C5b is important in late events of the complement cascade, an orderly series of reactions which coordinates several basic defense mechanisms, including formation of the Membrane Attack Complex (MAC), one of the most basic weapons of the innate immune system, formed as an automatic response to intrusions from foreign particles and microbial invaders. It essentially pokes microscopic pinholes in these foreign objects, causing loss of water and sometimes death. C5a, the other cleavage product of C5, acts as a highly inflammatory peptide, encouraging complement activation, formation of the MAC, attraction of innate immune cells, and histamine release involved in allergic responses. The origin of C5 is in the hepatocyte, but its synthesis can also be found in macrophages, where it may cause local increase of C5a. C5a is a chemotactic agent and an anaphylatoxin; it is essential in the innate immunity but it is also linked with the adaptive immunity. The increased production of C5a is connected with a number of inflammatory diseases. Human polypeptide C5a contains 74 amino acids and has 11kDa. NMR spectroscopy proved that the molecule is composed of four helices and connected by peptide loops with three disulphide bonds between helix IV and II, III. There is a short 1.5 turn helix on N terminus but all agonist activity take place in the C terminus. C5a is rapidly metabolised by a serum enzyme carboxypeptidase B to a 72 amino acid form C5a des-Arg without C terminal arginine. C5a is an anaphylatoxin, causing increased expression of adhesion molecules on endothelium, contraction of smooth muscle, and increased vascular permeability. C5a des-Arg is a much less potent anaphylatoxin. Both C5a and C5a des-Arg can trigger mast cell degranulation, releasing proinflammatory molecules histamine and TNF-α. C5a is also an effective chemoattractant, initiating accumulation of complement and phagocytic cells at sites of infection or recruitment of antigen-presenting cells to lymph nodes. C5a plays a key role in increasing migration and adherence of neutrophils and monocytes to vessel walls. White blood cells are activated by upregulation of integrin avidity, the lipoxygenase pathway and arachidonic acid metabolism. C5a also modulates the balance between activating versus inhibitory IgG Fc receptors on leukocytes, thereby enhancing the autoimmune response. C5a interact with receptor protein C5a1, C5aR or CD88 on the surface of target cells such as macrophages, neutrophils and endothelial cells. C5aR is a member of the G-protein-coupled receptor superfamily of proteins, predicted to have seven transmembrane helical domains of largely hydrophobic amino acid residues, forming three intra- and three extra-cellular loops, with an extracellular N-terminus and an intracellular C-terminus. 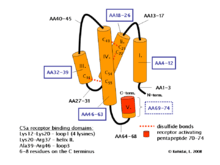 C5a binding to the receptor is a two-stage process: an interaction between basic residues in the helical core of C5a and acidic residues in the extracellular N-terminal domain allows the C-terminus of C5a to bind to residues in the receptor transmembrane domains. The latter interaction leads to receptor activation, and the transduction of the ligand binding signal across the cell plasma membrane to the cytoplasmic G protein Gi type GNAI2. Sensitivity of C5aR to C5a stimulation is enhanced by Lipopolysaccharides exposure, yet this is not due to C5aR upregulation.<. C5L2 is another C5a receptor that is thought to regulate the C5a-C5aR effects. There is apparently contradictory evidence showing decoy receptor activity conferring anti-inflammatory properties and also signalling activity conferring pro-inflammatory properties. C5a is a powerful inflammatory mediator, and seems to be a key factor in the development of pathology of many inflammatory diseases involving the complement system such as sepsis, rheumatoid arthritis, inflammatory bowel disease, systemic lupus erythemotosis, psoriasis. The inhibitor of C5a that can block its effects would be helpful in medical applications. One of inhibition substances is analogue of compstatin or monoclonal antibody against C5 called eculizumab however they are not specific only for C5a and interfere with others. Another candidate is PMX53 or PMX205 that is highly specific for CD88 and effectively reduces inflammatory response. C5a has been identified as a key mediator of neutrophil dysfunction in sepsis, with antibody blockade of C5a improving outcomes in experimental models. This has also been shown in humans, with C5a-mediated neutrophil dysfunction predicting subsequent nosocomial infection and death from sepsis. 1 2 3 4 Manthey HD, Woodruff TM, Taylor SM, Monk PN (2009). "Complement component 5a (C5a).". Int J Biochem Cell Biol. 41 (11): 2114–7. doi:10.1016/j.biocel.2009.04.005. PMID 19464229. ↑ Andreas Klos; Elisabeth Wende; Kathryn J. Wareham; Peter N. Monk (2013). "International Union of Pharmacology. LXXXVII. Complement Peptide C5a, C4a, and C3a Receptors". Pharmacological Reviews. 65 (1): 500–543. doi:10.1124/pr.111.005223. PMID 23383423. 1 2 Ward PA (2004). "The dark side of C5a in sepsis.". Nat Rev Immunol. 4 (2): 133–42. doi:10.1038/nri1269. PMID 15040586. ↑ Raby AC, Holst B, Davies J, Colmont C, Laumonnier Y, Coles B, Shah S, Hall J, Topley N, Khol J, Morgan BP, Labeta MO (2011). "TLR activation enhances C5a-induced pro-inflammatory responses by negatively modulating the second C5a receptor, C5L2.". European Journal of Immunology. 41 (9): 2741–2752. doi:10.1002/eji.201041350. PMC 3638321 . PMID 21630250. ↑ Klos A, Wende E, Wareham KJ, Monk PN (2013). "International Union of Pharmacology. LXXXVII. Complement peptide C5a, C4a, and C3a receptors". Pharmacol. Rev. 65 (1): 500–43. doi:10.1124/pr.111.005223. PMID 23383423. ↑ Woodruff TM, Crane JW, Proctor LM, Buller KM, Shek AB, de Vos K, et al. (2006). "Therapeutic activity of C5a receptor antagonists in a rat model of neurodegeneration.". FASEB J. 20 (9): 1407–17. doi:10.1096/fj.05-5814com. PMID 16816116. ↑ Jain U, Woodruff TM, Stadnyk AW (2013). "The C5a receptor antagonist PMX205 ameliorates experimentally induced colitis associated with increased IL-4 and IL-10.". Br J Pharmacol. 168 (2): 488–501. doi:10.1111/j.1476-5381.2012.02183.x. PMC 3572573 . PMID 22924972. ↑ Huber-Lang, Markus S.; Younkin, Ellen M.; Sarma, J. Vidya; McGuire, Stephanie R.; Lu, Kristina T.; Guo, Ren Feng; Padgaonkar, Vaishalee A.; Curnutte, John T.; Erickson, Richard (2002-09-15). "Complement-Induced Impairment of Innate Immunity During Sepsis". The Journal of Immunology. 169 (6): 3223–3231. doi:10.4049/jimmunol.169.6.3223. ISSN 0022-1767. PMID 12218141. ↑ Conway Morris, Andrew; Kefala, Kallirroi; Wilkinson, Thomas S.; Dhaliwal, Kevin; Farrell, Lesley; Walsh, Tim; Mackenzie, Simon J.; Reid, Hamish; Davidson, Donald J. (2009-07-01). "C5a Mediates Peripheral Blood Neutrophil Dysfunction in Critically Ill Patients". American Journal of Respiratory and Critical Care Medicine. 180 (1): 19–28. doi:10.1164/rccm.200812-1928OC. ISSN 1073-449X. PMC 2948533 . PMID 19324972. ↑ Morris, Andrew Conway; Brittan, Mairi; Wilkinson, Thomas S.; McAuley, Danny F.; Antonelli, Jean; McCulloch, Corrienne; Barr, Laura C.; McDonald, Neil A.; Dhaliwal, Kev (2011-05-12). "C5a-mediated neutrophil dysfunction is RhoA-dependent and predicts infection in critically ill patients". Blood. 117 (19): 5178–5188. doi:10.1182/blood-2010-08-304667. ISSN 0006-4971. PMID 21292772. ↑ Morris, A. Conway; Anderson, N.; Brittan, M.; Wilkinson, T. S.; McAuley, D. F.; Antonelli, J.; McCulloch, C.; Barr, L. C.; Dhaliwal, K. (2013-11-01). "Combined dysfunctions of immune cells predict nosocomial infection in critically ill patients". British Journal of Anaesthesia. 111 (5): 778–787. doi:10.1093/bja/aet205. ISSN 0007-0912. PMID 23756248.